Can CH get worse? This is a question that I’ve seen pop up a number of times lately, so I wanted to address it plain and simple. Literally, cerebellar hypoplasia means the underdevelopment of the brain’s cerebellum. This underdevelopment is a congenital condition that occurs usually while the kittens are still in the womb (learn more about the causes here), although sometimes the cerebellum’s growth can be stunted in the first few weeks after a kitten’s birth. That said, once the cerebellum’s growth is stunted/underdeveloped, that’s it. It’s not a degenerative disease. Once the cat has the condition, he has it. It will not progress. The trouble with CH is that many vets are unfamiliar with it. Consequently, there are some false assumptions that vets make. For example, some vets believe that it’s impossible for a CH cat to have any sort of quality of life, so they believe CH cats should be euthanized. Similarly, they may not be familiar enough with the condition to diagnose it properly. In fact, they may misdiagnose another condition as CH. This is not impossible to do, since cerebellar hypoplasia is known for two prominent characteristics: wobbly walking and head tremors. However, there are many other reasons why a cat may wobble. Sometimes the cat’s wobbly walking may be another condition, sometimes it can be cerebellar hypoplasia *plus* another condition. If your cat’s CH is worsening, or if your cat has another health issue, you’ll want your vet (you may want to get a second opinion) to officially diagnose the CH (if it does turn out to be CH) and check for other health issues and conditions. If you’re looking for a vet who is familiar with CH, check out this map. You may be able to find a CH friendly vet close to you. Some cats do have more severe cases of the condition than others, but that’s not because the cat’s CH has worsened. Cerebellar hypoplasia does not impact every cat in the same way. Some have mild cases of the condition, others have it to a more severe degree. Learn more about the varying degrees here. 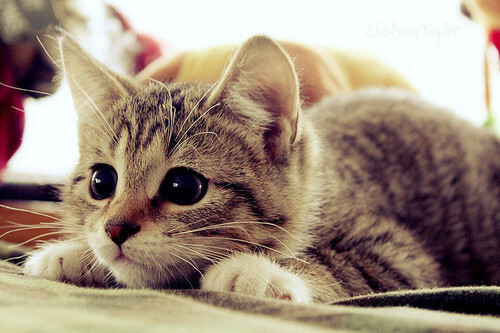 The CH severity can usually be identified in the first few weeks to months of a kitten’s life. I said above that the condition will not progress, and that’s true. In fact, some CH cat parents – myself included – have found that our CH cats have become more capable and mobile over the years thanks to exercise. We’ve also learned that a cat’s brain can rewire itself much like a person’s brain. Like the human brain, even if the cerebellum (which controls fine motor movement) is damaged, physical therapy, exercise and the like can help the muscles, while the movements and motions help rewire the brain. I do want to add that while CH itself doesn’t get worse, and almost all cases of CH cats that I’ve heard of talks about the cats becoming more capable and mobile as they get older thanks to muscle development and cats learning to compensate, I have a girl whose mobility actually got worse over the years. I contribute this to the fact that her CH was severe enough that she was never able to actually get up on her own and be able to developer those muscles for walking, which meant her increasing body weight actually made it more difficult for her to get around as she aged. Shinju’s development and progress was actually exactly opposite that of my other 2 more moderately affected girls, and she started out being able to use the litterbox on her own as a kitten to needing to wear diapers during the past few years. I do wonder if we had gotten her a cart when she was still developing it could’ve helped, but at the time we considered it and didn’t think it was the best option for her. That’s really interesting, thanks for sharing! I’m curious if other parents of severe CH kitties have experienced the same thing. It makes sense, and I’m eager to learn more. I’ll email you soon – especially since I haven’t emailed you in quite a while! Hope you’re all doing well! We just lost an almost 4-year old kitty…the sweetest, most loving kitty ever…she had always had a slight head tremor, but it didn’t seem to interfere with anything she wanted to do. Recently, I had noticed her almost tripping when she was walking…like one of her front legs just sort of collapsed when walking. But still, it wasn’t really bad…and since she would sleep with her front legs under her body and turned backward, I thought maybe her leg was just asleep. Then she needed to have her teeth cleaned. The vet did all the blood work and everything was within normal limits. He cleaned her teeth, and the day after she came home, she ate & drank and used her litter box. But the next day, she refused to eat from her bowl or drink from her water bowl. She even acted confused…she would go up to the bowl and sort of sniff it and then walk away. I hand-fed her for a few days…took her back to the vet and he did more blood work…all normal. The other thing she would do after I fed her, was that she would sniff the tile floor and scratch like she was in the litter box and act like she was trying to bite the floor. The vet just said he didn’t know what was wrong. Her walking got worse all the time. He put her on an IV drip for a day, thinking maybe her glucose level was too low. She ate a tiny bit of food that night, and then back to not eating. We took her to another vet, and she said it was probably a congenital neurological problem. We could have taken her to a veterinary college for more tests…but it just didn’t seem right to put her through any more trauma, so we had to let her go. Do you think what she had could have been CH? Could the anesthesia from the teeth cleaning have accelerated it somehow? It all seemed to happen after the teeth cleaning. We can’t help thinking maybe there was something we could have done to save our sweet little girl. I’m SO very sorry to hear about your loss. It’s always so terribly sad whenever we lose one of our furbabies. Unfortunately, I can’t say if she may have had CH. A few cats – with and without CH – have trouble with anesthesia, so it could have been that, but there’s no way to know for sure. I have had two CH cats. I captured three feral kittens 3 years ago and one of the three developed CH. Yes, he started out normal and within about 5 months began shaking and losing balance and showed all signs of CH. As he got older, he could not walk and would just urinate and poop on himself. Unfortunately, after a year we had to put him down. Over a year ago I captured another feral kitten from the same mother. He seemed perfectly fine for the first 5 months and then exactly the same thing happen to him as happened to my first CH cat. He began to shake a little and then gradually he lost all balance. He is just over a year and a half and has learned to lean on his side and lift his tale and legs out of the way to go to the bathroom. When he starts to squirm, we know he has to go to the bathroom and we take him outside (usually every 5 hours or so). In the last month, he has began to urinate every 2 and a half hours. He is very small 4 1/2 pounds. He eats well (3 meals a day). We have to put a bib on him and keep the food right in front of his face (sometimes even using a spoon to help him). When I took my other cats in for their shots, I talked to the vet and she said he probably has other brain problems that has caused all of these problems. My husband will not let me take him in to get any tests done. He said if we take him into the vet, we will have him put to sleep. Has anyone else had anything similar happen to them? I am worried that my little guy doesn’t have much longer to live. He basically is like a 3 month old baby. He just eats, sleeps, and poops. He doesn’t seem like he is suffering and occasionally even purrs. Please send me your thoughts.